In Tuscany, they call pork loin roast arista (from the Greek aristo, literally “best”). It’s an aristocratic hunk of meat, to be sure, and it’s about to take your holiday feast over the top. I like to think of it as the pork equivalent of beef prime rib—but with an eminently friendlier price tag. 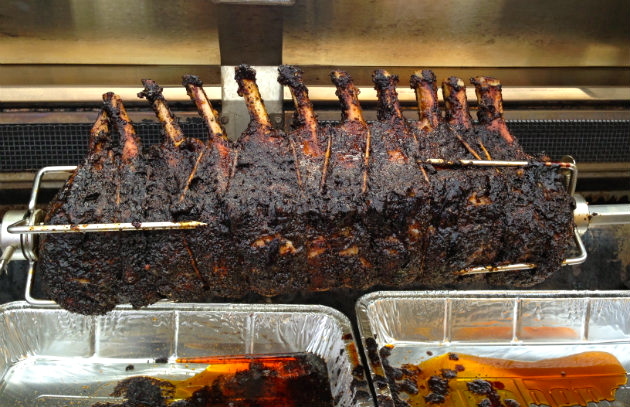 My favorite seasoning for pork loin rib roast is a coffee based spice mix I call java rub. Click here for the recipe. Or make life easy for yourself and order a can of my Best of Barbecue Java Rub. My favorite cooking method is, you guessed it, on a grill—more specifically on the rotisserie—over a charcoal fire made fragrant with apple wood. If you use a Weber kettle, you’ll also need a rotisserie ring. And once you start spit-roasting meats with it over charcoal wood smoke, you’ll wonder how you ever lived without it. Don’t have a rotisserie? Indirect grill the roast at medium-high (400 degrees) until the internal temperature reaches 145 degrees (if you like your pork with a blush of pink) or 155 degrees if you like it cooked all the way through. Use an instant read thermometer to be sure. Either way, you’ve freed up valuable kitchen real estate (like the oven) for side dishes. And given yourself an unimpeachable excuse to get some fresh air. Get the recipe for Coffee-Crusted Spit-Roasted Pork Loin Roast with Caramelized Apple Sauce. From all of us here at Barbecuebible.com, we wish you happy holidays! May you eat, er, high on the hog now and throughout the new year.